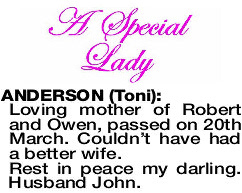 Loving mother of Robert and Owen, passed on 20th March. Couldn't have had a better wife. Rest in peace my darling. Husband John. A Memorial Service to celebrate the life of Mrs Toni Anderson, late of Kelmscott, will be held in the Simplicity Funerals Chapel, 138 Third Ave, KELMSCOTT TUESDAY (02.04.2019) commencing at 10:00am.